Harvest, build, defend, then worry about the pollution you're causing! Ever since Henry Ford popularized the assembly line, boys and girls around the world have dreamed of running their own factory. Virtual factory, that is, the kind where you can sit at your computer and have fun instead of wearing an unsightly hardhat and toting a metal lunchbox around. Thanks to Factorio, that dream can be a reality! 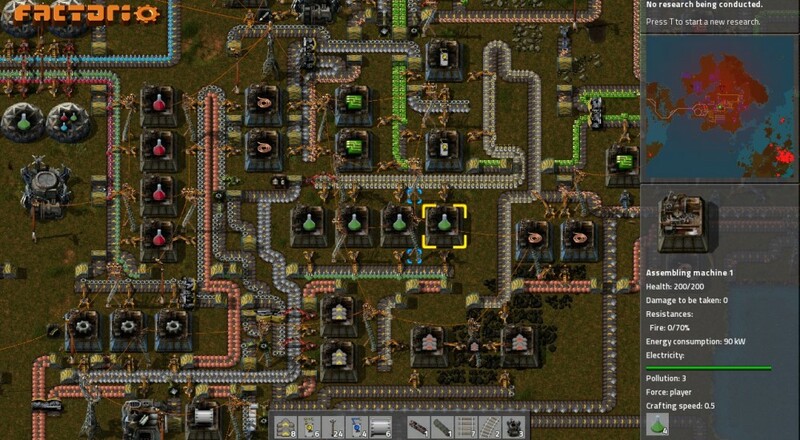 Factorio is all about automated logistics, which is fancy talk for "you build and maintain a factory that does stuff". You need basic resources to make things, you need production lines to refine things, more complex structures to assemble things, and so on. It's all one big chain of resource hunting and efficiency tweaking, exactly the kind of thing we want in our simulations. You even have to power the factory and defend it from attackers. The trailer below introduces the gameplay quite well. Frequent updates have helped Factorio build a loyal fan base, but it's the fairly recent addition of online co-op that got our attention. You and your pal can hop into the same wasteland to harvest resources and build factory parts together. Because the game actually gives you an avatar to run around with, multiplayer works surprisingly well. A demo for Factoria is currently available, as is a buy-in for the alpha version of the game. A Steam Greenlight campaign is also planned for the near future. Page created in 1.4732 seconds.